Yay Scott has arrived. I have to say that I was a bit worried about the weather & whether he would be able to fly in to Queenstown. For the last few days there has been low cloud all around Wanaka & I was worried it would be the same near Frankton (where Queenstown airport is). He rang at 8:30 to say that there was a 50 minute delay due to low cloud at Frankton. We left Wanaka at 9:15 & pulled in to this spot, to find a geocache at 9:45. It was good timing because Scott rang to tell me that they were boarding the plane. We found the geocache & signed the log, but I agree with the owner of the cache that our reading on the GPS wasn't 45S either. It was very cold, about 2C, as you can tell by the boys standing with their hands pulled up into their sleeves. We arrived into Frankton at about 10:50 & as we were arriving I saw the plane coming in to land. We parked & picked up Scott & then went through to Queenstown to get some morning tea. 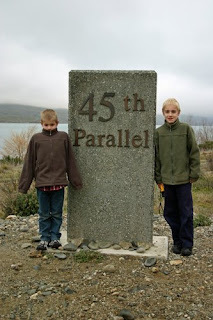 We then drove back to Wanaka, stopping at Lowburn to find another geocache. This was a nice easy cache to find & we even took away a travel bug (Nemo) away with us. We arrived in Wanaka & had lunch. After lunch Scott took the boys for a walk to the dinosaur park & managed to brave the cold for a good couple of hours. There are forecasts for snow over night & I say, let it snow, let it snow, let it snow! because all is right with the world now that Scott is here.